The 180EE Series is the entry level acrylic bird eye. 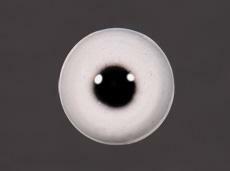 It features a round pupil with life-like feathering and a single iris color. This series is useful for birds as well as for small sculptures, carvings, decoys, lures, etc. Use the common practices of working with acrylic eyes such as non-marring tools and non-chemical cleanup. Available in a wide array of colors. Certain colors are only available in limited sizes. Use the drop down Color/ Size menu to select. If the size is not available in the color you need please contact us and we will try to get it for you. Codes in parenthesis are color codes for easy reference if you decide to phone our customer service department.